Here is a recap of Week 5 of the 2017 NFL Season with a Tuesday Morning QB & thanks again to AP Sports/ Pro 32 for photos & articles. DETROIT (AP) — Cam Newton wore a black hat with a white button on the left side to honor Rosie the Riveter before and after showing he was very focused on football. 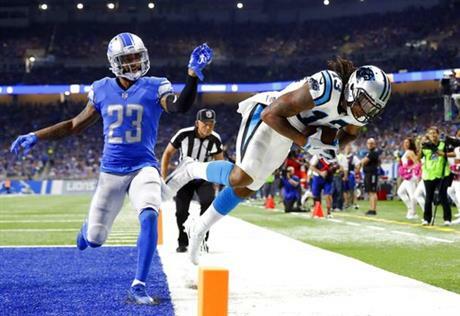 The embattled quarterback threw three touchdowns through three quarters, helping the Carolina Panthers build a lead big enough to hold off the Detroit Lions for a 27-24 win Sunday. The 2015 NFL MVP said he put Rosie the Riveter, flexing her right arm, on his hat after doing homework to learn her iconic impact on World War II. “I just wanted to have a little notion, a shout out, to all the strong women,” Newton said. He was 26 of 33 for a season-high 335 yards. On perhaps the game’s key play, he converted a third-and-9 from the Carolina 24 with a sharp, 17-yard pass to Kelvin Benjamin with 2:00 left while clinging to a three-point lead against a team out of timeouts. Newton threw a 6-yard TD pass to rookie Christian McCaffrey to pull the Panthers into a 10-10 tie early in the second quarter and a 10-yard pass to Devin Funchess for a tiebreaking score with 48 seconds left in the first half. With a perfectly lofted 31-yard pass to Benjamin, Newton put Carolina up 24-10 early in the third. “He did a real nice job under some unfortunate circumstances,” Carolina coach Ron Rivera said. Matthew Stafford, limping after being sacked and hit a lot, threw a 4-yard TD pass to tight end Darren Fells with 5:56 left and a 20-yard pass for a score to the former professional basketball player with 3:22 to go. The quarterback didn’t have as much success connecting with starting tight end Eric Ebron, who dropped a pass in the end zone and had another pass go through his hands. Even though Ebron has a history of dropping passes, Detroit coach Jim Caldwell insisted he’s not concerned about it. Protecting Stafford has become an issue. He has been sacked six times in two straight games after being sacked a total of just six times over his first three games. Charlotte Observer reporter Jourdan Rodrigue was not working in the Ford Field press box during the Panthers-Detroit Lions game. “Taking some time off,” Mike Persinger, the executive sports editor of The Charlotte Observer, wrote in an email. Newton declined to provide much of a comment about her absence at the game. Panthers tight end Ed Dickson had five receptions for a career-high 175 yards, a total that surpassed his production from each of the previous three seasons with the Panthers. He had 64- and 57-yard catches in the first half for two of his three receptions of 50-plus yards in his eight-year career. Clearly, Dickson is making the most of an opportunity to play for injured starter Greg Olsen. Panthers: CB Daryl Worley had an ankle injury in the third quarter, but was able to finish the game. Lions: Stafford played through what appeared to be an ankle injury and DT Haloti Ngata left with an elbow injury. Panthers: Host Philadelphia on Thursday night. Lions: Play at New Orleans next Sunday. Wentz tossed three scoring passes on three consecutive attempts in the first quarter, including 59 yards to Torrey Smith, 11 yards to Zach Ertz and 15 yards to Trey Burton. He connected with Nelson Agholor for a 72-yard TD in the third quarter that left six-time Pro Bowl cornerback Patrick Peterson shouting on the sideline. Wentz was 11 for 12 for 225 yards and three TDs on third down. “To be that efficient, that’s huge,” Wentz said. The Eagles entered with the NFL’s second-best third-down offense and converted their first four chances, including two of Wentz’s early TDs. “We got ourselves into some winnable downs and we weren’t able to get off the field,” Peterson said. On the opening drive, Wentz tossed a 12 yard pass to Ertz on third-and-11 and a 16-yard pass to Jeffery on another third-and-11. Then he found Burton on a fade for a 7-0 lead. Wentz’s TD pass to Ertz came on third-and-6 to make it 14-0. He hit Smith in stride on third-and-5 for a 21-0 lead. “Our execution was pretty good, Carson made accurate throws and the guys did a nice job route running,” coach Doug Pederson said. The Cardinals finally got going when Palmer threw a 13-yard TD pass to John Brown to cut it to 21-7. Agholor’s TD catch was on third-and-19. He blew past safety Budda Baker, caught Wentz’s perfect pass over the shoulder and used a spin move and stiff arm to reach the end zone. Wentz made a mistake late in the second quarter after guiding the Eagles to the Cardinals 25. 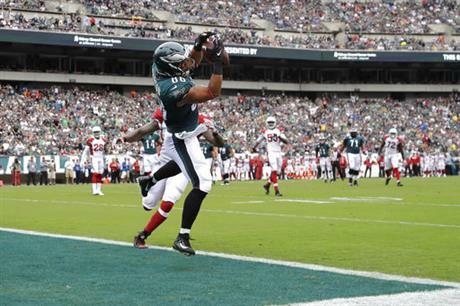 He overthrew Ertz and Antoine Bethea made a toe-tapping interception in the end zone. Kenjon Barner had a 76-yard punt return to set up Philadelphia’s second TD. Barner was signed after veteran Darren Sproles tore his ACL in Week 3. Eagles cornerback Patrick Robinson deflected Phil Dawson’s 51-yard field goal at the end of the first half. Arizona’s Larry Fitzgerald caught a pass for the 200th consecutive game, third-longest streak in NFL history. Fitzgerald, who had 11 TDs in eight games vs. Philadelphia, was held to six catches for 51 yards. Cardinals: LS Aaron Brewer (arm) left in the first quarter. T Jared Veldheer (knee) and DT Olsen Pierre (ankle) were injured in the third. Eagles: RT Lane Johnson left at halftime with a head injury. … Two-time Pro Bowl DT Fletcher Cox (calf) missed his second straight game and RB Wendell Smallwood (knee) also didn’t play. Cardinals: Host the Tampa Bay Buccaneers. Eagles: Visit the Carolina Panthers on Thursday night. 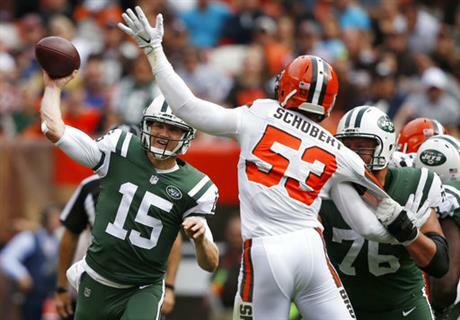 CLEVELAND (AP) — On his first trip back to Cleveland, Josh McCown experienced something new — and something unexpected. McCown won only one game as a starter in two seasons with Cleveland, and that came in Baltimore. He went 0-7 at home for the Browns (0-5), who released him on Feb. 7 in a cost-cutting move. The 38-year-old wasn’t looking for payback, but he got it with two second-half scoring tosses. Little was expected this season of the Jets (3-2), but they’ve become a shocking success story. Kizer was understandably upset following the game. Kizer stood on the sideline next to Jackson wearing a baseball cap and blank expression as Hogan completed five straight passes, including his scoring pass to Njoku, who snared the pass with a diving, one-handed grab. Jackson said he’ll wait to watch the tape before making a decision on his quarterback for next week when the Browns visit Houston. Jets: Host New England next Sunday. Browns: At Houston next Sunday. The worst of all was the injury to Beckham on the series before the Chargers’ winning touchdown. 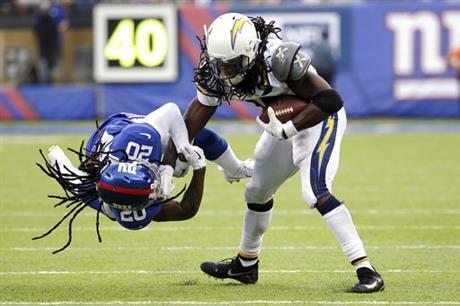 He jumped to catch a high Eli Manning pass and had Los Angeles cornerback Casey Hayward pin his ankle making a tackle. Players immediately signaled the sideline and Beckham was eventually carted off in obvious pain with a hand covering his face. The touchdown pass was Rivers’ third of the game and came three plays after Kyle Emanuel had a sack, forced fumble and recovery against Manning at the Giants 11-yard line. It also came four plays after Beckham became the fourth Giants receiver knocked out of the game. Manning’s attempt to rally the Giants in the final minute ended when he was intercepted by Tre Boston at the Los Angeles 33. On the drive New York used three tight ends and its only remaining receiver, Lewis. This game was filled with errors and there were a combined 21 penalties. Rivers (21 of 44 for 258 yards) and Manning (21 for 36 for 183) each missed open receivers deep. The Giants got a safety on a play when Chargers center Spencer Pulley snapped the ball from the 7-yard line before Rivers was ready, forcing the quarterback to toss the ball out of the end zone. 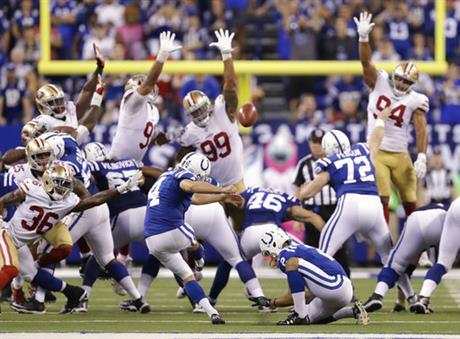 Each team converted a PAT that hit the upright and bounced the right way. Referee Jeff Triplette announced “San Diego” on a call. INJURIES: After playing in 84 straight games, Giants DE Olivier Vernon (ankle) was sidelined for the first time in his career. New York C Weston Richburg (concussion) had started the last 26 games … Chargers starting LB Korey Toomer did not suit up because he was not able to play on special teams. NOTES: The Giants did not give up a sack last week in a loss to the Buccaneers. Joey Bosa and Emanuel each had two. Darius Philon had the last one. … Giants S Darian Thompson had a team-high 11 tackles and his first career interception. PITTSBURGH (AP) — The Jacksonville Jaguars spent the first month of the season looking equal parts awesome and awful, taking one step toward respectability immediately followed by a baffling step back. On the road facing a team expected to play deep into January and perhaps beyond, the Jaguars instead served notice their best start in nearly a decade is hardly a fluke. Turns out, running back Leonard Fournette can fly in more ways than one. And a secondary getting better by the week appears ready to make the Jaguars a legitimate threat in the underwhelming AFC South. Fournette soared for a 2-yard touchdown and sprinted 90 yards for another, and Jacksonville used Pick 6s on back-to-back Pittsburgh drives to stun the Steelers 30-9 on Sunday. And decidedly different. The Jaguars (3-2) have already matched their 2016 win total and are above .500 after five games for the first time since 2010 thanks in large part to Fournette’s precocious play. The rookie finished with a season-high 181 yards, the knockout punch delivered with his dash to the open end of Heinz Field with 1:47 to go that sent whatever portion remained heading for the exits following Pittsburgh’s worst home loss in coach Mike Tomlin’s 11 seasons. 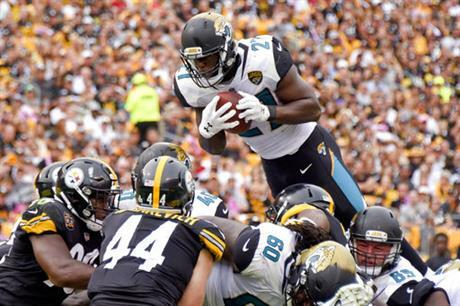 “They drafted me for a reason,” Fournette said, adding later his only goal on the third-longest touchdown run ever against the Steelers was simply to not get caught. Fournette and Jacksonville’s defense were so dominant that quarterback Blake Bortles only attempted one pass in the second half. The way the Jaguars were overwhelming Steelers quarterback Ben Roethlisberger, Bortles didn’t have to do much other than watch Fournette go to work. Pittsburgh (3-2) again struggled to get big-play production out of an offense that was supposed to be among the league’s best. Five games in, the Steelers look average. Roethlisberger completed 33 of 55 for 312 yards and his career-high five interceptions, the most by a Steelers quarterback since Mark Malone threw five against Cleveland in 1987. A week after a sideline outburst generated headlines and drew Roethlisberger’s ire, Steelers wide receiver Antonio Brown caught 10 passes for 157 yards. Brown didn’t score, but twice men attempting to cover him did. The Steelers led 9-7 in the third quarter when Roethlisberger looked left for Brown. Jacksonville defensive lineman Abry Jones tipped it into the hands of Telvin Smith, who chugged 28 yards to put Jacksonville in front with 6:38 left in the period. The Jaguars defense struck again on Pittsburgh’s next series. Roethlisberger tried to hit Brown down the sideline. Jalen Ramsey deflected it, Barry Church came down with it and 51 yards later Jacksonville had turned a two-point deficit into an 11-point lead without taking an offensive snap. When Gipson made a leaping pick near the Jacksonville goal line in the final minutes to thwart any chance of a Pittsburgh rally, it gave the Jaguars 15 takeaways on the season. They managed an NFL-low 13 while going 3-13 in 2016. Fournette gave the Jaguars an early lead with a spectacular 2-yard touchdown dive in the second quarter. The former LSU star basically jumped from the 4 and flew untouched over the line of scrimmage into the end zone. Not bad for a 240-pound back known more for his heft than his hops. Steelers wide receiver Martavis Bryant, who was held to 21 yards receiving on five receptions. Jacksonville came in with the top-ranked pass defense in the league, though that number was a bit of a misnomer. The Jaguars also came in last in rushing yards allowed, giving up an average of 165 per game. Pittsburgh managed just 70 on 20 carries, with Le’Veon Bell mustering just 47. Jaguars: Host the Los Angeles Rams next Sunday. Steelers: Travel to Kansas City next week in a rematch of last year’s AFC Divisional Round playoff. Pittsburgh edged the Chiefs 15-13 to reach the AFC title game. MIAMI GARDENS, Fla. (AP) — Adam Gase stubbornly stuck with Jay Cutler until his quarterback finally silenced the boobirds. 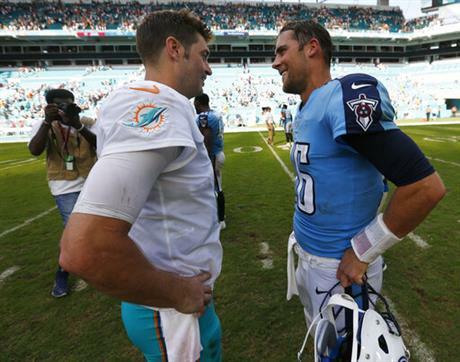 Cutler drew jeers while struggling through much of the Miami Dolphins’ 2017 home debut, but his fourth-quarter touchdown pass helped them overcome another dismal offensive showing Sunday to beat the Tennessee Titans 16-10. The crowd chanted repeatedly for backup quarterback Matt Moore before Cutler finally got Miami going with a 58-yard drive capped by his 6-yard touchdown pass to Jarvis Landry for the tiebreaking score. Tennessee played without quarterback Marcus Mariota, who was inactive because of a left hamstring injury suffered a week ago. Replacement Matt Cassel went 21 for 32 for 141 yards and was sacked six times. Cutler went 12 for 26 for just 92 yards, but Gase said his QB wasn’t the problem. The Dolphins came in ranked last in the NFL in points and yards per game, and struggled against a Titans team that allowed 57 points against Houston a week ago. Cassel’s best moment came when he drove the Titans 69 yards for a tying touchdown to start the second half. Backup tight end Phillip Supernawcaught an 11-yard pass for his first career touchdown. CINCINNATI (AP) — The Bengals took A.J. Green at his word. They kept throwing his way, even after the ball repeatedly slipped through his wet hands. The elusive receiver found a way to make the difference, just as promised. Green contributed to three turnovers that kept it close, but he also had a 77-yard touchdown and another long catch that set up the go-ahead score Sunday, rallying Cincinnati to a 20-16 victory over the Buffalo Bills in a steady rain. Tyrod Taylor’s off-target pass was picked off near midfield with 2:14 left, clinching it for Cincinnati. Taylor finished 20 of 37 for 166 yards with a touchdown pass to Brandon Tate . He also was sacked six times. The Bengals changed offensive coordinators after failing to get a touchdown in their first two games. Green complained that they weren’t getting the ball to their difference makers in the biggest moments. He caught seven passes for 189 yards Sunday, the third-highest total of his career. Green ran past rookie cornerback Tre’Davious White and caught Andy Dalton’s pass in stride for a 77-yard score on the Bengals’ second possession. 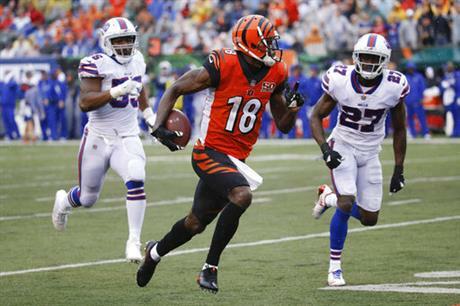 Green also had a hand in the Bengals’ three turnovers that kept the Bills in it. Green had passes go off his hands and his chest for a pair of interceptions . He also fumbled after a catch . Dalton twisted his left ankle in the first half and finished the game with a limp, getting it heavily taped at halftime. He was 22 of 36 for a season-high 328 yards. The Bills got little out of an offense down to four healthy receivers because of injuries, managing only 221 yards. They’ve been held under 300 yards in each of their last four games. In his last two games , Dalton has completed 47 of 66 passes for 614 yards with five touchdowns. Since the Bengals changed coordinators, his passer rating is 116.2. The Bengals showed clips from the Steelers’ loss on the videoboard during timeouts, drawing cheers from the crowd of 52,367 that was their smallest of the season. A fan banner in the upper deck said: “Just Play Football.” A pro-Trump banner was displayed briefly criticizing players and owners, signed with #MakeAmericaGreatAgain. During the anthem, a fan held a cardboard sign that said “Cincy Stands For The Anthem.” It was the first game at Paul Brown Stadium since President Donald Trump tweeted that players should be fired if they protest during the anthem, prompting a pushback from players and some team owners. Bills and Bengals players all stood. Bills: Following their bye, the Bills host Tampa Bay and Oakland in the next two weeks. OAKLAND, Calif. (AP) — Mike Wallace got excited as soon as he saw the script, knowing he’d have an early chance to deliver the big passing play that has been missing too often this season for Baltimore. 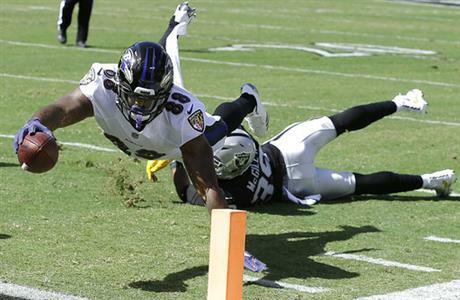 Wallace caught a tone-setting 52-yard pass from Joe Flacco on the first play from scrimmage to set up an early touchdown for the Ravens, and Jimmy Smith added a fumble return for a score on the next drive that helped fuel Baltimore’s 30-17 victory over the short-handed Oakland Raiders on Sunday. That pass set up tight end Vince Mayle’s 2-yard touchdown run on an end-around and the Ravens (3-2) got going after being held scoreless in losses the past two weeks. Flacco had struggled to get the ball downfield against Jacksonville and Pittsburgh, averaging less than 4 yards an attempt those games. But the early deep ball to Wallace helped open things up and the two connected later on a 54-yard pass and a 27-yarder, equaling the team’s season total of 20-yard pass plays in the previous four weeks. The Ravens had also lost two in a row following a 2-0 start, but reversed that slide thanks to Flacco and the opportunistic defense. Flacco completed 19 of 26 passes for 222 yards. The Coliseum was rocking after Lynch’s TD cut Baltimore’s lead to 24-17 late in the third quarter. The Ravens, who had been held to three-and-outs the first two drives of the second half, responded with a 72-yard drive to a 21-yard field goal by Justin Tucker that gave Baltimore a 10-point lead. Flacco converted a pair of third downs on the drive, completing a 13-yard pass to Breshad Perriman on third-and-3, and a 27-yarder to Wallace on third-and-8. The Raiders drove into Baltimore territory on the next drive and faced fourth-and-3 from the Ravens 44 with about nine minutes left. Coach Jack Del Rio opted to punt despite the 10-point deficit, and Marquette King sent it into the end zone for a touchback. Baltimore then drove 64 yards in 6:26 to take a 13-point lead. Flacco showed off his improvisational skills in the first quarter when he tripped on a drop back after a shotgun snap. He got up and stumbled before getting off a 6-yard pass to Jeremy Maclin that converted a third down. The Ravens ended up scoring on the drive on a 1-yard run by Javorius Allen that made it 21-3. Ravens RB Terrance West departed on the opening drive with a left calf injury following a 13-yard run. He did not return. … The Raiders lost four players to injuries: Marquel Lee (ankle), FB Jamize Olawale (concussion), LB Corey James (knee) and CB Antonio Hamilton (knee). Ravens: Host Chicago on Sunday. Raiders: Host San Diego on Sunday. LOS ANGELES (AP) — When Todd Gurley stretched the ball toward the goal line, Earl Thomas soared in with perfect timing and a martial arts-style chop to the running back’s arm, knocking the ball out for a touchback. After an impressive start to the season, the Rams thought they were ready to run past the NFC West’s perennial power. Thomas and the Seattle Seahawks barely swatted away the upstarts in a defensive performance full of timely brilliance. Russell Wilson passed for 198 yards and a touchdown, and Thomas forced two of the Rams’ five turnovers in the Seahawks’ 16-10 victory Sunday. Jimmy Graham scored late in the first half in a defense-dominated win for the Seahawks (3-2), who shut out the NFL’s highest-scoring offense in the second half and won despite getting outgained 375-241. Thomas made enormous plays early and late. The veteran safety stripped Gurley at the pylon to kill the Rams’ opening drive, and he intercepted Jared Goff’s fluttering pass at midfield with 6:02 to play. “For our guys to come through and finish like that, that’s as exciting as the game gets,” Seattle coach Pete Carroll said. Tavon Austin rushed for a 27-yard TD for Los Angeles (3-2). After a quick start to the season that caught the NFL’s attention, the Rams wasted their strong defensive game when new coach Sean McVay’s offense ran into the Legion of Boom. 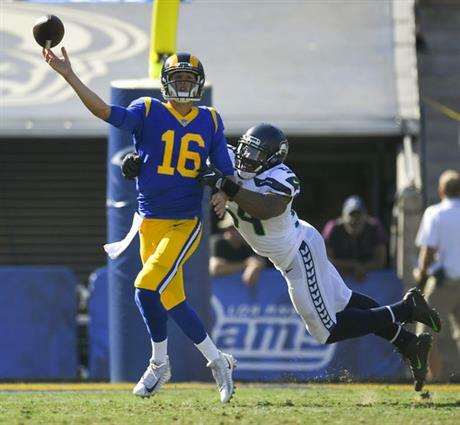 Wilson didn’t have big numbers, but the quarterback put on a performance of vintage resourcefulness, repeatedly wriggling away from the Rams’ pursuing defense to make plays. Blair Walsh’s two second-half field goals turned out to be the difference for Seattle, which managed just 97 yards in the second half. Austin, the wide receiver used more often as a ball carrier by McVay, scored the game’s first points when he took a handoff and high-stepped to the end zone early in the second quarter. Wilson then threw an interception to Rams rookie John Johnson, who returned it 69 yards before Wilson made a possible touchdown-saving tackle. Thomas forced Gurley’s fumble on a play that was ruled a touchdown on the field, but went to video review because it could have been seen three ways: A touchdown, out of bounds on the 1, or a fumble and touchback. Officials eventually ruled Gurley had lost control of the ball an instant before stepping out of bounds. “I did a great job watching the Bruce Lee movies, and it kind of carried over to the football field,” Thomas said of his chop. Thomas made an incredibly similar play against the St. Louis Rams in 2014, chopping the ball out of Benny Cunningham’s hand at the goal line. Seahawks: DE Michael Bennett went to the locker room late in the first half after injuring his right foot. He returned for the second half, keeping Seattle sound at the position while playing without injured Cliff Avril and Quinton Jefferson. Rams: Starting safeties Lamarcus Joyner and Maurice Alexander both didn’t play. Joyner had a hamstring injury, but Alexander’s absence wasn’t injury-related. “It was nothing disciplinary,” McVay said, calling it a personnel decision. Seahawks: A bye week, followed by a trip to the New York Giants on Sunday, Oct. 22. 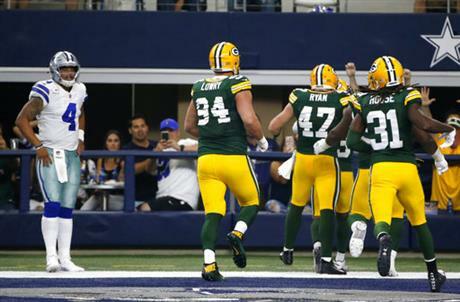 ARLINGTON, Texas (AP) — Aaron Rodgers had more magic in store for the Dallas Cowboys, who can’t seem to find the mojo that carried them a year ago. Rodgers threw a 12-yard touchdown pass to Davante Adams with 11 seconds remaining, lifting the Packers over Dallas 35-31 on Sunday in another thriller nine months after their divisional playoff win on the same field. Rodgers capped a 75-yard drive in just 1:02, going toward the same end zone as in the playoff game. In that game, Rodgers’ long completion to Jared Cook on third-and-20 in the final seconds set up Mason Crosby’s winning field goal as time expired in a 34-31 win. Adams had been in the concussion protocol but was active 10 days after leaving the field on a stretcher on a helmet-to-helmet hit that resulted in a suspension for Chicago linebacker Danny Trevathan. He had seven catches for 66 yards and two touchdowns. Dak Prescott, who had touchdown passes on Dallas’ first three drives, put the Cowboys in front on an 11-yard touchdown run with 1:13 remaining to cap a 17-play drive that lasted almost nine minutes. But another defensive letdown, just like a year ago in the postseason, left Dallas (2-3) already with the same number of losses from the magical rookie season when Prescott and running back Ezekiel Elliott led the Cowboys to the No. 1 seed in the NFC. The Packers (4-1) had gone ahead earlier on Damarius Randall’s 21-yard interception return for a touchdown, the third of five lead changes in the fourth quarter. Green Bay rallied from 15 points down in the first half after letting a 21-3 lead get away in last season’s playoff win. Aaron Jones became the first Green Bay running back with 100 yards in his first start as a rookie since Samkon Gado in 2005. He had 19 carries for 125 yards and a touchdown. He replaced Ty Montgomery, out after breaking some ribs in the win over the Bears. “He earned the opportunity to start today, and he produced,” coach Mike McCarthy said. 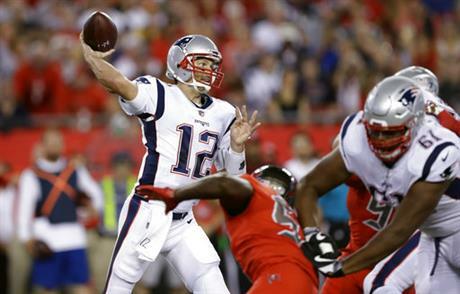 Rodgers was 19 of 29 for 221 yards and three touchdowns, and set up the winning score with an 18-yard scramble. After an incompletion to Adams working against rookie Jourdan Lewis, Rodgers went there again. Rodgers made the grab as Lewis turned too late. Prescott looked the part of Rodgers, scrambling to set up big completions and running 21 yards himself on one play to help the Cowboys build a 21-6 lead. He was 25 of 36 for 251 yards and three first-half touchdowns, two to Cole Beasley and one to Dez Bryant, who joined Hall of Famer Bob Hayes as the only Dallas receivers with at least 70 TD grabs. Before Prescott’s TD run for a 31-28 lead, there were consecutive challenges from each coach over a first down. A catch by Beasley was ruled a first down and reversed, as was Elliott’s fourth-down plunge when he was ruled short but replay showed the ball reaching Green Bay’s 19-yard line. Officials then measured the first down, and the Cowboys got it by half a football. DE David Irving returned from a four-game suspension for Dallas with two sacks. He had a sack and three forced fumbles with a recovery in last year’s 30-16 win in Green Bay during the regular season. Crosby missed his first two PATS, the first time in his 11-year career to miss more than one in a game. The first clanged off the left upright in the first quarter, and the second was wide left in the second quarter. He made all 36 kicks in 2015, the first year of the longer distance, but missed three last season. Packers: WR Jordy Nelson, who scored his sixth touchdown for the first Packers lead early in the fourth quarter, wasn’t on the field during the final drive. Coach Mike McCarthy said he was being evaluated for an undisclosed injury. … Rookie CB Kevin King left with a concussion in the first half. Cowboys: Rookie CB Chidobe Awuzie left with a hamstring injury for the second time this season. He’s also missed two games with the injury. Packers: First NFC North road game at Minnesota next Sunday. Cowboys: Bye, then at San Francisco on Oct. 22. HOUSTON (AP) — The Kansas City Chiefs got another big game from Alex Smith and a little help on special teams to remain undefeated Sunday night. 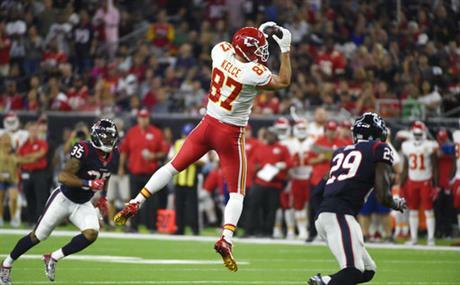 Smith threw for 324 yards and three touchdowns and Tyreek Hill added a punt return score in the fourth quarter to lead the Chiefs to a 42-34 victory over the Houston Texans in a game where J.J. Watt broke his left leg. Deshaun Watson’s 48-yard touchdown pass got the Texans within six early in the fourth quarter before Smith extended the lead for Kansas City (5-0) to 32-20 on a 10-yard pass to De’Anthony Thomas with about nine minutes left. It’s the second 300-yard passing game for Smith this season and gives him 11 touchdown throws. Hill padded the lead when he returned a punt 82 yards for a touchdown. Watt, the three-time Defensive Player of the Year, was injured in the first quarter and the team announced that he sustained a tibial plateau fracture, but didn’t provide any details on how long he’ll be out. The defensive end returned this season after missing the final 13 games last year after his second back surgery. Kansas City’s Charcandrick West caught two touchdown passes and Travis Kelce had eight receptions for 98 yards in the first half, but didn’t return after halftime and the team said he was being evaluated for a concussion. They flipped him onto his back and were looking at his left leg. He was then helped to his feet and looked to be in a lot of pain and didn’t appear to be able to put any weight on the leg as he was helped off the field by two Texans officials. He remained on the sideline under a tent for a few minutes before being taken to the locker room on a cart and then taken by ambulance to the hospital. Chiefs’ safety Steven Terrell suffered a concussion on the opening kickoff. … Houston linebacker Whitney Mercilus injured his chest in the first quarter and didn’t return. O’Brien said he is concerned about the injury, but didn’t provide any details on it. … Houston safety Corey Moore suffered a concussion. … Reid said that he thinks receiver Chris Conley has a ruptured Achilles tendon. Chiefs: Host Steelers next Sunday. Texans: Host Cleveland next Sunday. 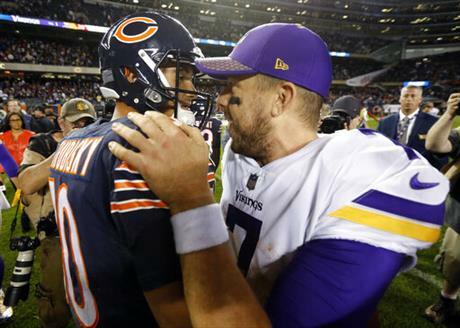 CHICAGO (AP) — The Minnesota Vikings know they have an insurance policy if Sam Bradford’s knee remains a problem. Case Keenum has proven this before and did it again Monday against the Chicago Bears in a 20-17 victory. “I’ve tried to prepare like I’ve been the starter,” Keenum said. “I think that helps when you’re called upon and need to step in, so you can do the same job as the guy that’s been doing it. With a game against the Green Bay Packers coming Sunday, the Vikings won’t know Bradford’s status until later in the week. Bradford failed to make it through his first game back since suffering swelling and soreness in a surgically repaired left knee. Sacked four times, an obviously immobile Bradford came out just before halftime after a 5-for-11 performance. “It just got to a point where it was hurting him bad enough where he couldn’t finish,” Vikings running back Jerick McKinnon said. Keenum came in and led the win by completing 17 of 21 passes for 140 yards and a touchdown. He was 14 for 18 and 119 yards in the second half. Keenum was 1-2 in three starts before Monday’s Vikings win. “He did a great job executing,” McKinnon said. “It’s real tough in this league to come into that situation and do what he did. Keenum threw a 13-yard TD pass to Kyle Rudolph in the third quarter for a 10-2 lead, and in the fourth quarter the Vikings benefited from Harrison Smith’s interception to score the winning points on a 26-yard Kai Forbath field goal with 12 seconds remaining. The interception spoiled Mitchell Trubisky’s — he completed 12 of 25 for 128 yards. Even with running back Dalvin Cook out for the year with a torn ACL, the Vikings showed they have breakaway speed in the backfield. McKinnon had a 58-yard TD run around the right side in the third quarter for a 17-9 lead. It was the Vikings’ longest run of the season. McKinnon finished with 95 yards on 16 carries. “My main focus was to make plays, feed off Latavius (Murray), C.J. (Ham), those guys, the running backs, bring the energy and make plays,” McKinnon said. The Bears stayed in the game with trick plays. One came from special teams and the other from offense on a two-point conversion. Punter Pat O’Donnell threw a 38-yard TD pass to Benny Cunningham to pull the Bears within 10-9 in the third quarter. Cunningham was wide open 10 yards downfield on a fake punt and dodged one tackle try before going to the end zone. “Whether it’s a turnover, steal, a first down — whatever it is you just want to make an impact throughout the game to kind of help those guys on offense and defense,” Cunningham said. A trick two-point conversion tied the score at 17-17 when Trubisky handed to Jordan Howard and he handed it to Zach Miller on a reverse. Miller pitched it to Trubisky and he walked into the end zone. Trubisky was down about his fourth-quarter interception, but Bears coach John Fox called it an upbeat debut regardless of the big mistake. Trubisky’s leadership was a key. He also scrambled for 22 yards in addition to his passing. Smith, who made the decisive interception, was equally impressed with Trubisky. “You can tell he definitely has some skill and he is going to be a player,” Smith said. Vikings tight end Kyle Rudolph and teammates had planned an unconventional TD celebration, and Rudolph’s 13-yard TD catch in the third quarter gave them a chance to do it. “Duck, duck, goose was planned in the huddle right before we went out,” Rudolph said. “We called the play, the play we run all week in practice. I knew somebody was going to score. Playing without suspended Danny Trevathan and with Jerrell Freeman and Nick Kwiatkoski injured, the Bears lost a fourth inside linebacker when John Timu went out with a knee injury. They finished with Christian Jones and Jon Anderson on the field.